Palestinian officials have confirmed that the resistance movement Hamas and the Israeli regime have agreed on a ceasefire mediated by Egypt to stop cross-border fire in the Gaza Strip. A Palestinian official with knowledge of the ceasefire talks said Thursday that the truce was to begin at 20:45 GMT. Israel did not formally comment on the issue, but an Israeli official, speaking on condition of anonymity, denied a cease-fire had been reached. Another unnamed Palestinian official confirmed to Reuters the truce had been reached, saying, "Egyptian efforts managed to restore calm between Palestinian factions and Israel that will end the current escalation." "Palestinian factions will respect calm as long as Israel does," he added. Earlier in the day, Hamas deputy chief in Gaza Khalil al-Hayya said efforts to reach a truce with the Israeli regime were at “an advanced stage.” He added that the resistance movement would insist on its position that the Israeli blockade on the Gaza Strip has to be lifted as part of any talks with Tel Aviv. The development comes after two days of Israeli aerial raids against at least 150 positions in Gaza. The regime in Tel Aviv says the airstrikes were launched after a long-range rocket fired from the Palestinian coastal sliver hit an uninhabited area to the south of the occupied Palestinian territories. Hamas has claimed responsibility for the rocket attack, stressing that they were in retaliation for the killing of two Palestinians by Israeli forces. According to medical officials, the Israeli regime’s airstrikes killed Enas Khammash, a pregnant Gazan woman, and her 18-month-old daughter Bayan, as well as another Palestinian. Hundreds of Palestinian mourners took part in the funeral for the woman and the baby on Thursday in the central Gaza town of Deir al-Balah. Palestinian President Mahmoud Abbas earlier urged the United Nations to stop Israel’s latest aggression against Gaza, which has been under a crippling Israeli siege for the past decade. Egypt and the UN intervened to broker the ceasefire and prevent Israel from launching another war on Gaza after tensions escalated in recent weeks. Israel has killed more than 150 people since March when Palestinians began to stage protests on the border to demand an end to the blockade and the return of the Palestinians to the occupied territories. Truce mediated by Egypt goes into effect at 10:45pm on Thursday evening, after 24 hours of hostilities, with nearly 200 rockets fired from Gaza at Israel and the IAF attacking over 150 targets in the strip; Gaza source confirms ceasefire, Israeli sources deny it. Israel and Hamas have reportedly reached a ceasefire under Egyptian mediation, which went into effect at 10:45pm Thursday, according Al Jazeera. A source in Gaza confirmed the ceasefire to Ynet, while two Israeli officials denied a truce had been reached, in line with Israel's policy of ambiguity. An Israeli official said Hamas has been asking for a ceasefire since Thursday morning, but the IDF continued attacking significant targets. Hamas' Al-Aqsa TV channel reported late Thursday that a ceasefire has taken hold "on the basis of mutual calm." It said the deal was mediated by Egypt and other regional players. A senior Hamas official, speaking on condition of anonymity because he was not authorized to speak to the media, said the deal would formally go into effect at midnight. He said the agreement merely ends the latest two-day burst of violence between Israel and Hamas and added that Egypt would continue efforts to broker a long-term cease-fire. Over 180 rockets have been fired from Gaza over the past 24 hours, with the IDF retaliating with heavy bombardments in the strip, destroying a 5-story building, we well as several terror tunnels, military complexes and other targets. At least seven Israelis were wounded from the Gaza rockets, with one landing as far as Be'er Sheva. Mortar shells and rockets also hit the entrance of a residential home in Sderot, a house in Hof Ashkelon Regional Council and a building in an industrial zone of the Sha'ar HaNegev Regional Council. The Iron Dome intercepted at least 30 rockets. Palestinian officials said at least three people were killed in the Israeli attacks: Hamas fighter Ali Ghandour, 23-year-old Enas Khamash, who was pregnant, and her 18-month-old daughter Bayan. At least five civilians were wounded. Gaza's Health Ministry said the militant and the civilians were killed in separate incidents. Prime Minister Benjamin Netanyahu held security consultations with Defense Minister Avigdor Lieberman, IDF chief Lt. Gen. Gadi Eisenkot, Shin Bet Director Nadav Argaman and head of the National Security Council Meir Ben Shabat ar the Kirya IDF headquarters in Tel Aviv on Thursday afternoon. Following the consultations, a government official said that "Hamas has suffered a serious blow. Israel will continue acting with strength." According to the official, the prime minister and defense minister instructed the IDF to prepare for any scenario. Channel Ten said Netanyahu delayed the Security Cabinet meeting that followed these consultations by two hours to allow the Egyptians to press forward with their mediation work. After a four-hour meeting, the Cabinet issued a short statement, saying it had directed the army "to continue taking strong action against the terrorist elements." It did not elaborate. Lt. Col. Jonathan Conricus, a military spokesman, said Israel had "ground troops that are ready to deploy. We are reinforcing the southern command and Gaza division." He wouldn't comment on Israeli media reports of troops preparing for a possible ground operation. Israel and Hamas have fought three wars since the Islamic militant group seized control of Gaza in 2007. Despite the animosity, the enemies have signaled—through their contacts with Egypt—that they want to avoid another war. Hamas is demanding the lifting of an Israeli-Egyptian border blockade that has devastated Gaza's economy, while Israel wants an end to rocket fire, as well as recent border protests and launches of incendiary balloons, and the return of the remains of two dead soldiers and two Israelis believed to be alive and held by Hamas. At the United Nations, Israel's ambassador, Danny Danon, urged the secretary-general and UN Security Council to condemn Hamas militants for what he called "the unprovoked terrorist attack" on southern Israel. Nickolay Mladenov, the UN Mideast envoy, said he was "deeply alarmed" and appealed for calm. He said the situation "can rapidly deteriorate with devastating consequences for all people." "Overall, we condemn the launching of missile attacks into Israel, and call for an end to the destructive violence. We've seen reports that 180 or so rocket attacks have taken place, shot from Gaza into Israel, and we fully support Israel's right to defend itself, and to take actions to prevent provocations of that nature," Nauert said. Tension along the Israel-Gaza border has escalated since late March, when Hamas launched what would become regular mass protests along Israel's perimeter fence with Gaza. The protests have been aimed in part at trying to break the blockade. Israel and Hamas have engaged in several bouts of fighting this month. The latest round erupted Tuesday, when the Israeli military struck a Hamas military post in Gaza after it said militants fired on Israeli troops on the border. Hamas said two of its fighters were killed after taking part in a gunfire parade inside a militant camp. The incident occurred while a group of senior Hamas leaders from abroad were visiting Gaza to discuss the ceases-fire efforts with local leaders. A top Hamas official told The Associated Press that the group waited for the delegation to leave Gaza before responding with rocket fire late Wednesday. An Israeli airstrike on a cultural center in Gaza City, on Thursday, turned the five-story building into rubble, according to WAFA correspondence. He said that Israeli warplanes fired 10 missiles at the building, for no apparent reason other than to inflict as much damage as possible in Gaza. 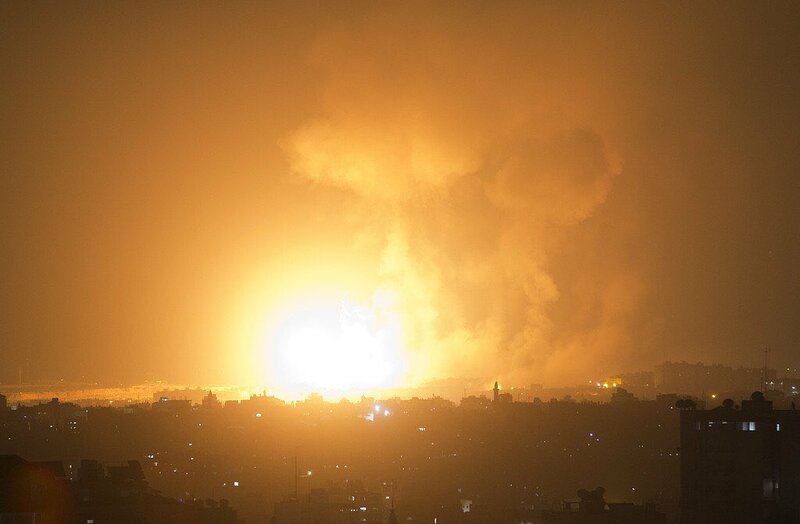 Israel has escalated its aerial attacks on Gaza, which started late Wednesday. At least 18 Palestinians were injured Thursday by an Israeli airstrike that flattened a cultural center west of Gaza City, according to the PIC reporter. Israeli F-16 warplanes fired at least eight rockets at the Said Al-Mashal Foundation for Arts and Culture in the middle of the city. The foundation confirmed on its Facebook page the offices in Gaza City had been destroyed, saying the building also hosted offices for the Egyptian community in Gaza. The Ministry of Health said 18 people were injured from the Israeli strike at the cultural center. Earlier Wednesday, Israel has escalated its aerial attacks on Gaza, killing three Palestinians including a woman and her 18-month-old baby. Efforts continued during the day to contain the tension in Gaza and prevent a break of a new war. 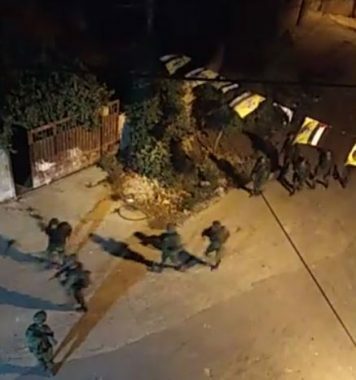 The Palestinian Prisoners’ Society (PPS) has reported that Israel soldiers abducted, overnight until dawn hours Thursday, seventeen Palestinians from their homes in several parts of the occupied West Bank. The PPS said the soldiers stormed and violently searched many homes, causing damage, and interrogated several Palestinians while inspecting their ID cards. The soldiers also installed roadblocks, before stopping and searching dozens of cars, and were extensively deployed in many Palestinian communities. In related news, the soldiers invaded and caused damage to many homes in Qalandia refugee camp, north of Jerusalem, and fired live rounds, rubber-coated steel bullets and gas bombs at local protesters. In Hebron, in southern West Bank, the soldiers summoned Islam Khatib Tamimi for interrogation, after storming and searching his home, in addition to invading the home of former political prisoner, Zeid Shaker al-Juneidi, and the home of Jamal al-Jabal, before confiscating cash during violent searches. Osama Jawdat To’ma, 33, Qaffin town – Tulkarem. Khaled Mohammad Ajjouli, 30, Qaffin town – Tulkarem. Waleed Mohammad Ajjouli, 27, Qaffin town – Tulkarem. Ali Mohammad Abu Bakr, 30, Qaffin town – Tulkarem. Luay Harsha, Qaffin town – Tulkarem. Sameeh Mousa Nawawra, 20, Bethlehem. Taleb Mahmoud Hamad, Einabus – Nablus. Kamal Hazeen, 26, Qalandia refugee camp, north of Jerusalem. Ali Khaled Hamad, 23, Qalandia refugee camp, north of Jerusalem. Bassem Zeid, Qalandia refugee camp, north of Jerusalem. Shadi Nabhan Faqeeh, Qotna, northwest of Jerusalem. Ahmad Khalil Sheikh Ibrahim, Aqabat Jaber refugee camp – Jericho. Khalil Jamal Sheikh Ibrahim, Aqabat Jaber refugee camp – Jericho. Media sources in Gaza have reported that, among various sites and areas targeted by Israeli missiles in the coastal region, are water wells, and tourist areas. 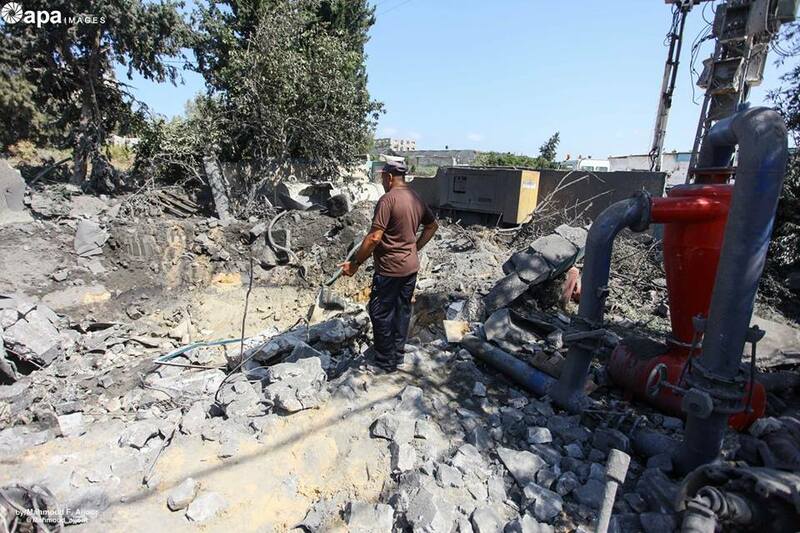 Yousef Abu Kamil, from the Public Relations department of al-Mughraqa Local Council, said the Israeli missiles destroyed a well owned by the city, and provides water for approximately 11.000 Palestinians. He added that the Israeli missiles also destroyed two cars of the local council, in addition to other property damage. Abu Kamil also said that the new building of the local council sustained property damage, in addition a radio transmission tower and a fuel pumping machine. In addition, Beit Lahia municipality said the army also bombarded its well, providing the residents with water, in addition to causing serious property damage to buildings and property owned by the city. The Israeli army claims its attacks targeted centers run by the al-Qassam Brigades, the armed wing of Hamas, yet, its missiles have led to civilian casualties, and extensive damage to homes and infrastructure in the besieged coastal region. The United Nations Special Coordinator for the Middle East Peace Process, Nikolay Mladenov, expressed his deep concern concerning the escalation in the besieged Gaza Strip. Nikolay Mladenov said in a statement issued on early Thursday, "I am deeply alarmed by the recent escalation of violence between Gaza and Israel." He stressed "for months I have been warning that the humanitarian, security and political crisis in Gaza risk a devastating conflict that nobody wants. The UN has engaged with Egypt and all concerned parties in an unprecedented effort to avoid such a development." He added that "if the current escalation however is not contained immediately, the situation can rapidly deteriorate with devastating consequences for all people." Mladenov also mentioned that he will continue working on addressing all humanitarian issues in Gaza. 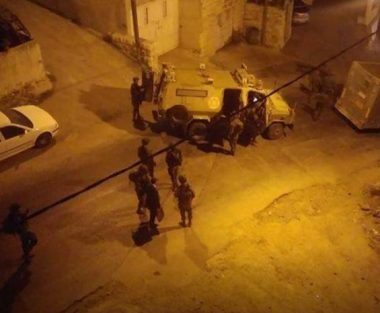 Several Israeli army jeeps invaded, overnight until early morning hours Thursday, Kufur Qaddoum town, east of the northern West Bank city of Qalqilia, and caused many Palestinians to suffer the effects of teargas inhalation during ensuing protests. Morad Eshteiwi, the media coordinator of the Popular Committee against the Annexation Wall and colonies in Kufur Qaddoum, said the soldiers invaded his home and removed a Palestinian flag, hanging on its rooftop. He added that many youngsters protested the invasion, while the soldiers extensively fired gas bombs, concussion grenades and rubber-coated steel bullets, causing many Palestinians to suffer the effects of teargas inhalation. Kufur Qaddoum witnesses frequent Israeli invasions, assaults and abductions as it continues to hold is weekly nonviolent processions against the illegal Annexation Wall and colonies, and against the closure of the main road, which was blockaded by the military fifteen years ago, to enable easy access for colonialist settlers driving to and from the Kedumim colony, built on private Palestinian lands. Despite the killing of a pregnant woman and her baby by an Israeli airstrike on their home Wednesday night, Israeli officials issued a statement later that night saying that they planned to continue the current escalation in Gaza with no end in sight. The Israeli military, one of the most powerful armies on the planet, launched a full-scale military assault on the besieged coastal Strip Wednesday night, dropping at least 140 bombs, according to the Israeli military spokesperson. The Palestinian population of Gaza, which includes more than one million children in its total population of two million, has no military. The ad hoc resistance groups that sprung up in recent years in Gaza to counter the Israeli military occupation of Palestinian land fired dozens of shells across the Israeli-militarized border in response. Israelis living in the town of Sderot, constructed provocatively close to the Gaza-Israel border, rushed to underground shelters. Nine were lightly injured. 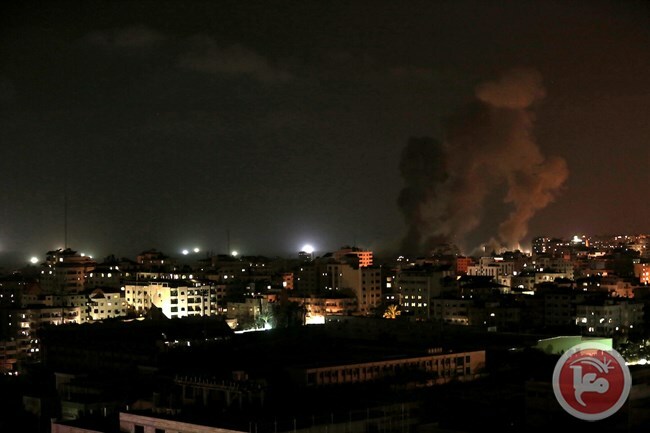 The Israeli occupation army at dawn Thursday launched a spate of renewed air raids on different areas of the Gaza Strip. 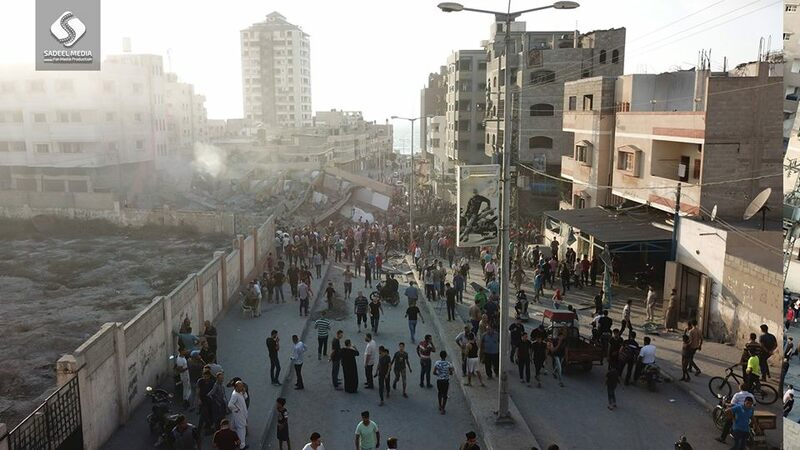 The Palestinian Information Center (PIC) in Gaza said that the airstrikes targeted sites belonging to the Palestinian resistance in northern and western Gaza, Khan Younis, and al-Shuja’iyya neighborhood. In response, the Palestinian resistance fired several projectiles at Israeli settlements adjacent to Gaza as well as military posts. The Hebrew media claimed that one rocket exploded in Eshkol regional council in the Negev leading some settlers to suffer injuries, including one seriously. The Palestinian Health Ministry has confirmed that Israeli army missiles have killed a pregnant Palestinian mother, and her infant daughter, 18 months of age, in central Gaza. The mother was nine months pregnant. 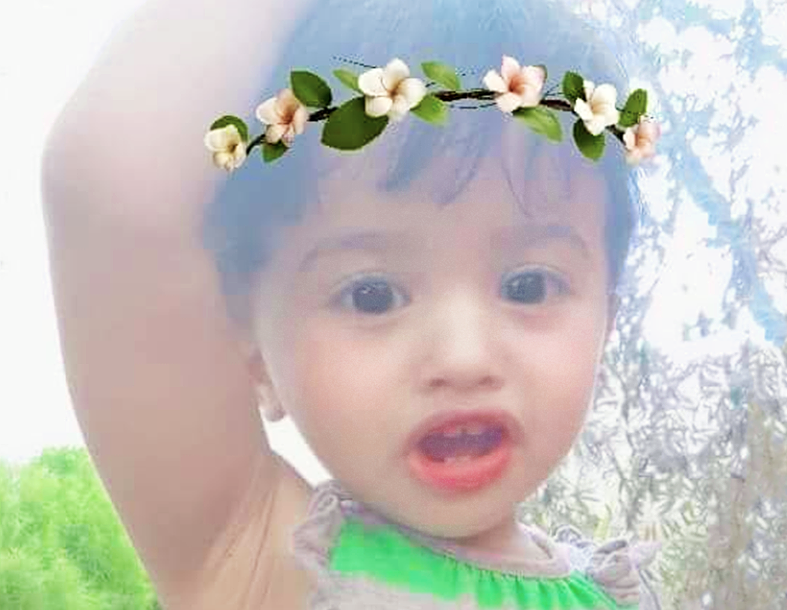 Dr. Ashraf al-Qedra, the spokesperson of the Health Ministry in Gaza, has confirmed that the soldiers killed a pregnant woman, identified as Enas Mohammad Abu Khammash, 23, and her child Bayan Abu Khammash, 18 months, in their home in al-Ja’farawi area, in Gaza’s Central District. Furthermore, the soldiers injured at least twelve Palestinians in ongoing Israeli bombardment of several parts of the Gaza Strip, and earlier killed one Palestinian, identified as Ali al-Ghandour, 30. In addition, the Israeli Air Force fired three missiles at a concrete factory, and three other missiles into a nearby area, northwest of Gaza city. 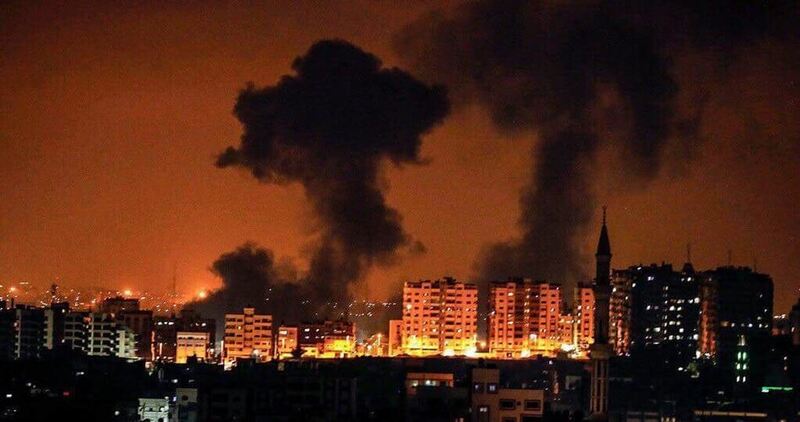 Media sources in Gaza said Israeli missiles also struck sites, run by armed resistance groups, in Rafah, in the southern part of the Gaza Strip, while more missiles were fired from drones into sites in the Sudaniyya area, northwest of Gaza city, and Beit Lahia, in northern Gaza. Also on Wednesday, the army fired several missiles into various areas of the Gaza Strip, including a building in the Sudaniyya area of northern Gaza, which was first struck by three missiles, followed by an additional six missiles, just minutes later. The Israeli army said it targeted several Hamas centers in Gaza, reportedly when six Israelis were injured in the Sderot settlement, in the Negev, “after eight shells were fired from Gaza”. Israeli Ynet News said that one Israeli man, aged 23, was injured by shrapnel in his leg, and added that “two pregnant women in addition to a man, 42 years of age, were treated for shock,” before being moved to Barzilai Hospital. It alleged that Hamas fighters fired live rounds at “civil engineering equipment”, used as part of a “anti-tunnel barrier’” which is being built along the barrier with Gaza, causing damage, before the army fire a tank shell at a Hamas post. Hamas said its fighters fired shells into nearby army posts, in retaliation to Israeli bombardment of the coastal region, and added that it has no Interest in escalation. Hamas leaders said that they are holding talks with Egypt, to restore calm to the region, and to avoid a potentially serious military escalation. For its part, the Israeli army said it raised the alert level along the border with Gaza, after noticing that Hamas fighters were evacuated from their posts along the border, a move that Hamas said was meant to ensure their safety, and avoid further escalation, while the army considered it as part of preparation for potential escalation. On Tuesday, the Israeli army killed two Hamas fighters, identified as Ahmad Abdullah Morjan, 23, and Abdul-Hafeth Mohammad Seelawi, 23, in northern Gaza. The Al-Qassam Brigades, the armed wing of Hamas, issued a statement denouncing the Israeli assassination of two of its fighters, in northern Gaza, and holding Israel accountable for any future escalation. It stated that the two fighters were part of a military training in “Asqalan” center, one of its training locations in northern Gaza, and that many Palestinians, including political leaders of Hamas, were in attendance.